I took the girls to the ballet a few weeks ago and wore this dress. It's fun to get all dressed up with the little gals and do something fancy just the three of us. This year we saw The Nutcracker and it was lovely. Poesy's finally getting to an age where she doesn't wear down by intermission, so this was our most pleasant ballet date so far. I love this dress, and it looks amazing with that pink coat and unicorn clutch. I think this is a gorgeous dress and would have been great for New Year's Eve, if you had no other choice. The story about your New Year's Eve dress is hilarious, and I can imagine that it must have been a gorgeous dress if you were that determined to wear it. That's dedication to a dress! 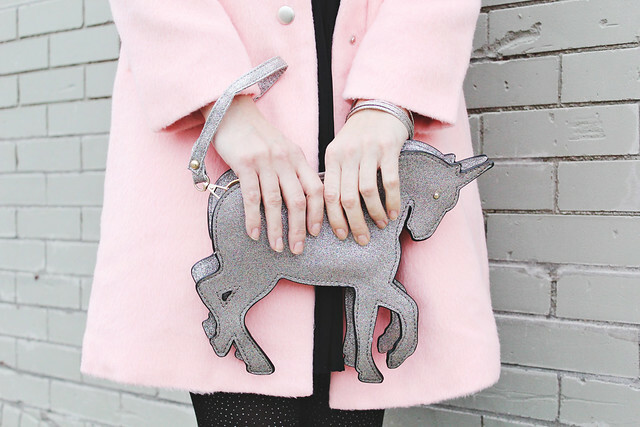 This dress is pretty great too, and the unicorn purse is such a quirky touch. Great wear. Sewn into your dress like the stars! Love this post. You look like a mix between Natalie Portman and Mila Kunis in Black Swan. So beautiful. So cute Katie! This pink coat is the perfect match! I totally fell in love with it! Essa bolsa é muito perfeita! This is presh! I love everything about it. Beautiful outfit, love the dress! haha, that is some dress dedication. :D i have to say, i love this outfit! so, so pretty. Lovely outfit! I love opportunities like ballets to be able to dress up fancy. :) That's a lot of dedication to your New Year's dress! It must have been stunning! Now that is persistence!! But this dress is a beaut too, especially cute with the candy floss pink coat and unicorn clutch. Love it. hahahaha oh dear, that sounds like an almost disaster... of course you would a) know what do to, b) actually have the things to sew it together. Love this outfit. Fun night. Hoping Hope is doing well these days!